Independent learning gives you more choice about what, when and how fast to study. It also prepares you to learn after you complete full time education. Students sometimes blame unfamiliar words for their reading difficulties. Glendinning and Holmstrom (1992) suggest two steps for dealing with unfamiliar words. The first step in finding the meaning of an unfamiliar word is to identify what kind of word it is – noun, verb, or adjective, etc. This can limit the range of possible meanings. The second step in finding the meaning of an unfamiliar word is to examine the immediate context of the word – the sentence in which the word appears. Often the sentence contains enough clues to help you to get an approximate meaning of the word. Look at this extract from a travel story and in particular the highlighted word at the end of the paragraph. As we flew north over countries like Botswana and Zambia, we saw fewer and fewer people, only huge areas of desert dotted with some small villages. I often wonder how these people survive in such a hostile environment. Finally we reached Kigali, the capital city of Rwanda. The skies were filled with dark grey clouds and in the distance I thought I heard the sound of thunder. I had been reading about the civil war there recently and so wasn’t surprised to find that Kigali International Airport was crowded with soldiers although they didn’t really look like soldiers; most of them were barefoot, wearing jeans and T-shirts but they were all carrying weapons and they were all wearing berets. Imagine that you do not know what the word ‘berets’ means. How can you make an educated guess at the meaning from the context of the sentence or paragraph? Well, one way is to break down the text and ask yourself questions about it. What are berets? No idea. What were they doing with the berets? They were wearing berets. This tells us that the berets are an item of clothing or some other personal belonging that people wear. Who was wearing the berets? Soldiers were wearing berets. This should indicate to us that the berets are an item of military uniform. But which item of military uniform? The soldiers were barefoot, wearing T - shirts and jeans, carrying guns and wearing berets. This allows us to eliminate army boots, green uniform tops and trousers and firearms which leaves us with headwear. We have already discovered we can make accurate and educated guesses about the meaning of words from the immediate surrounding context. We can also see that words are repeated or similar expressions used and that ‘families’ or ‘word sets’ of related vocabulary are common. Read this text and then do the activities that follow. Abu Dhabi, the capital of the United Arab Emirates, is a prime example of the “build it and they will come” strategy that is sweeping across the Arabian Peninsula, from Riyadh to Dubai. And the strategy appears to be working. The number of nights booked at Abu Dhabi hotels jumped 25% in the first half of 2013 compared to the same time in 2012, plus passenger arrivals at Abu Dhabi International Airport and revenues for national carrier Etihad Airways were both up 13% in the same time frame. In the last decade, nearly every global hotel chain has opened four- or five-star hotels in the central business district or on the Corniche, the city’s glittering waterfront. In 10 short years, Etihad Airways has grown to operate 1,300 flights a week to 86 destinations around the world. By late 2017 the enormous Midfield Terminal Complex (currently under construction) will open at Abu Dhabi International Airport, built to handle 20 to 30 million passengers per year. Globally recognised hospitals such as the Cleveland Clinic, and universities such as Paris-Sorbonne and New York University are opening satellite campuses here, too, helping the local economy diversify from its reliance on petroleum. Abu Dhabi is still very much a work in progress. The master-planned cultural enclave of Saadiyat Island, located about 10km north of the city centre, is currently a beehive of construction as a flurry of luxury hotels are built and multimillion-dollar outposts of international museums rise up alongside the Sheikh Zayed National Museum. Architect Jean Nouvel designed the unusual laced-dome Louvre Abu Dhabi, which will open in 2015. The contemporary, visually arresting, Frank Gehry-designed Guggenheim Abu Dhabi opens in 2017. Hotels – Elegant or Edgy? Abu Dhabi is home to the most expensive hotel ever built – the 11 billion dirham, 394-room Emirates Palace Abu Dhabi, which opened in 2005 at the south end of the Corniche with its its own marina and helipad. Even if you are not staying there, visit to enjoy a lavish high tea at Le Café or to gawk at the marble, crystal, gold and silver. Across the street is the stunning, sculptural 382-room Jumeirah at Etihad Towers, which opened in late 2011. Guests rave about the modern rooms, 12 restaurants and bars, dramatic water views, expansive pool/beach area and the courteous, helpful staff. Nearby, the new 283-room St Regis Abu Dhabi, opened August 2013, offers the luxury chain’s famous butler service and has soaring views from its perch between the 33rd and 50th floors of one of the two Nation Towers office buildings. Further inland near the iconic Sheikh Zayed Mosque, is the 447-room, Venetian-inspired Ritz-Carlton Abu Dhabi, Grand Canal, opened March 2013, where the most well-appointed (and expensive) rooms are located on the 7th floor club level overlooking the canal. These rooms have access to a stunning, glassed-in Club Lounge where guests enjoy breakfast and a regularly restocked buffet of snacks and canapés, plus views over the historic Al Maqtaa Fort. The visually stunning 499-room Yas Viceroy Abu Dhabi is situated on the edge of the Yas Marina – with half of it built on land, half over water. The entire structure, which includes the hotel and 12 dining and lounging venues, is covered by a gorgeous, curvilinear steel-and-glass canopy that mimics the look of a fishing net thrown over water. At night, its neon glow can be seen from all over the city. The hotel is located on the eastern side of town near the airport and Ferrari World – the largest indoor amusement park in the world. You will not believe your eyes when you see the new 189-room Hyatt Capital Gate Abu Dhabi hotel, located in a glass tower that leans at a record-breaking 18 degrees – more than Italy’s leaning tower of Pisa. The sleek five-star hotel is part of the Abu Dhabi National Exhibition Centre, located near the capital’s embassy and government district on the southern side of the central business district. The upscale dining scene in Abu Dhabi revolves around the big international hotels, each of which offers multiple restaurants that specialise in cuisine from all corners of the globe. For local Emirati dishes there are only a few places, But there are only a few that focus on local Emirati dishes, of which the most popular is Mezlai, tucked into the cavernous Emirates Palace hotel. Sit indoors or out and sample local seafood specialties such as jasheed (shark braised with tomatoes, onions, spices and lemon juice) or tender lamb medfoun, which is cooked slowly in a banana leaf and served with camel-milk mashed potatoes. To celebrate a deal, reserve a table on the water at Pearls & Caviar at the Shangri-La hotel on the eastern edge of downtown. Stylish and eclectic, the menu includes Mediterranean-inspired dishes such as grilled sea bass served with sweet potatoes, Sicilian figs and wild mushrooms. When you have finished eating, head upstairs to the all-white Pearls Bar which has a live DJ on weekend nights. For a casually chic business lunch, check out popular Nahaam, situated poolside at the chic Jumeirah At Etihad Towers hotel. The diverse international menu ranges from pizza and salads to sushi, grilled seafood or burgers. Consider packing your bathing suit as you will likely be tempted to indulge in a post-prandial dip in the pool. 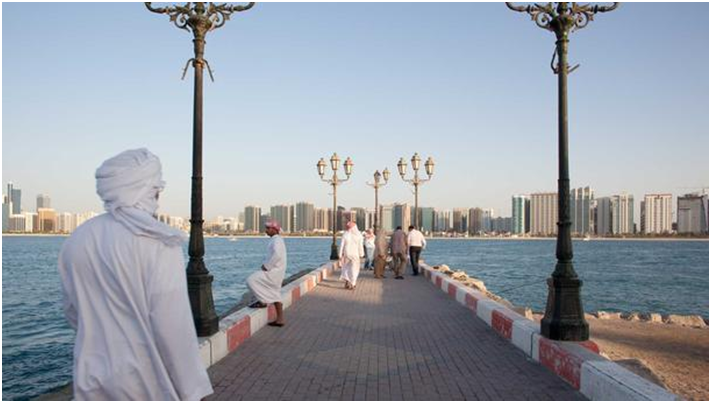 After a day of meetings or a long flight, join locals during the cooler evening hours on a stroll along the Corniche, which stretches for 8km along the western edge of the city. Sometimes it seems as though every resident and visitor has come out of the nearby hotels and residential towers to take in the sunset, cycle on the dedicated bike paths, splash in the warm waters of the Persian Gulf (know locally as the Arabian Gulf) and enjoy the lush gardens. It is especially popular among locals on Thursdays and Fridays, which are weekend nights in Abu Dhabi. When travelling in the UAE, it is difficult to miss the richly fragrant aroma of oud, an expensive resin harvested from the agarwood tree that is burned as incense or worn as perfume or cologne. You can purchase oud as blocks or chips along with a special burner, or buy the distilled oil, which is popular as a distinctive, long lasting fragrance. Ask for it at local perfume stores such as YAS perfumes (multiple locations) or Arabian Oud in the Marina Mall. In Abu Dhabi you will likely find more traditional adherence to Islamic customs around dress, gender roles and alcohol consumption than in Dubai, its flashy neighbour to the north. While Abu Dhabi sees itself as the protector of traditional Muslim values, Western ways are making inroads in the capital. It is best to rely on experienced colleagues or hotel concierge staff for help with cultural nuances around alcohol consumption and dress codes.